Two perfectly round meringue cookies – joined in the middle by a light cream filling – somehow contain all the flavor of a slice of cake without any of the regret. One bite and you’ll be hooked. The macaron is the much prettier, daintier, distant cousin of the lumpy, hairy, coconut-laden macaroon. 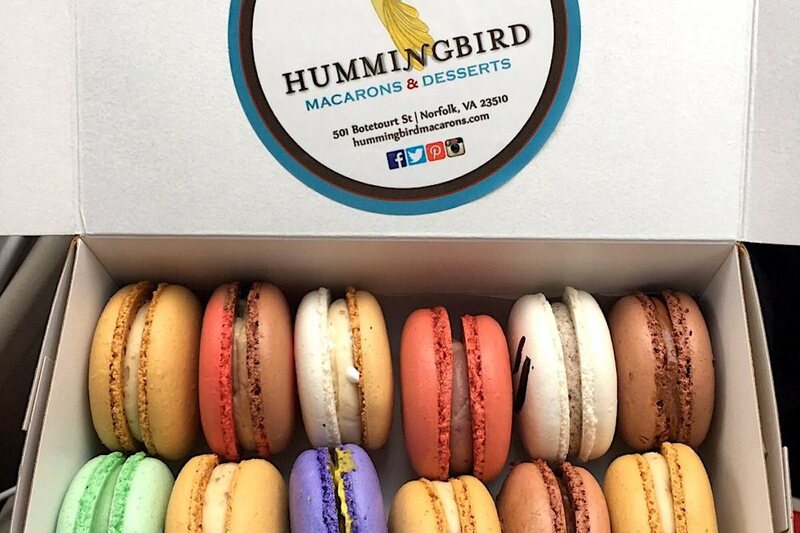 Hummingbird’s macarons contain the same basic elements others do: egg whites and water, white and confectioners’ sugar, and almond flour. But a secret, flavorless, ingredient makes these more delicious. And if you ask Hummingbird owner Kisha Frazier, she’ll freely share her secret: A small measure of failure is baked into each one. At 44, Frazier is the picture of success. She manages Hummingbird Macarons & Desserts, which has grown from three employees to 10 since 2014. She handles a full catering schedule and has a commercial kitchen that ships her treats nationwide. She helped open another popular Norfolk dessert shop and even runs the Hummingbird Tea Room and Chocolate Bar, a mentoring space and storefront in Selden Arcade.